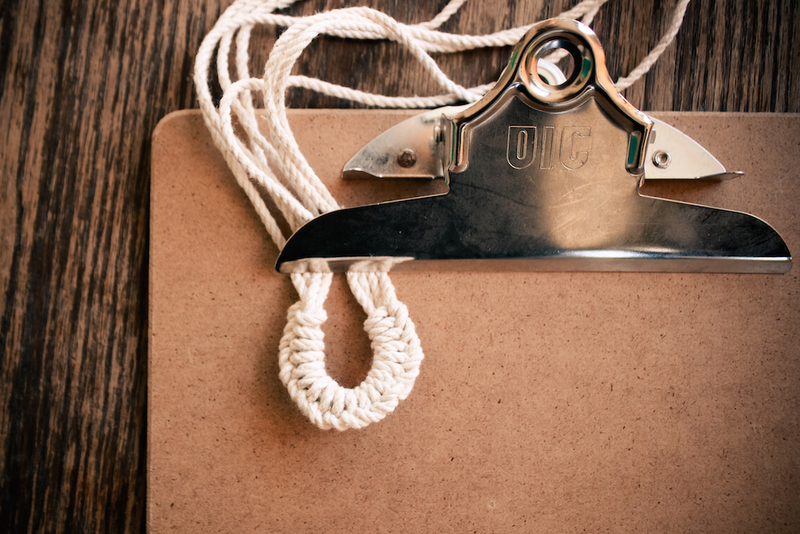 We are obsessed with macramé and are happy to tell you that it really is not very difficult. 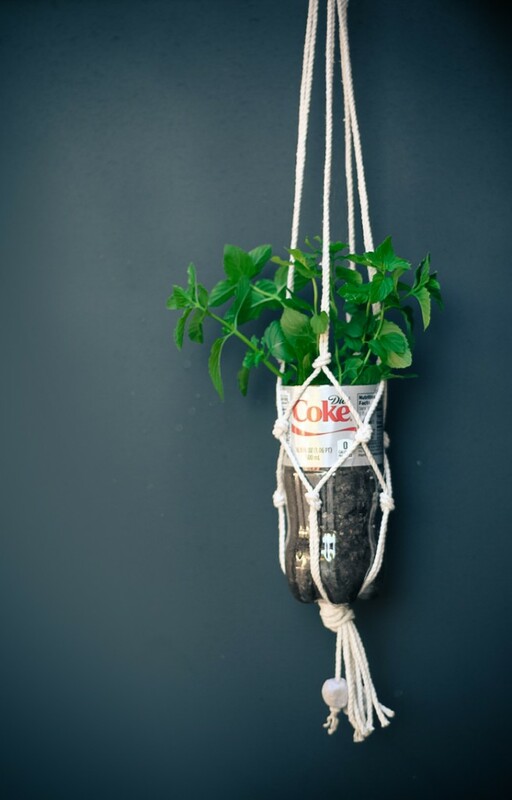 We are also obsessed with Diet Coke so we thought a hanging herb garden would be an ideal way to upcycle our Diet Coke bottles. 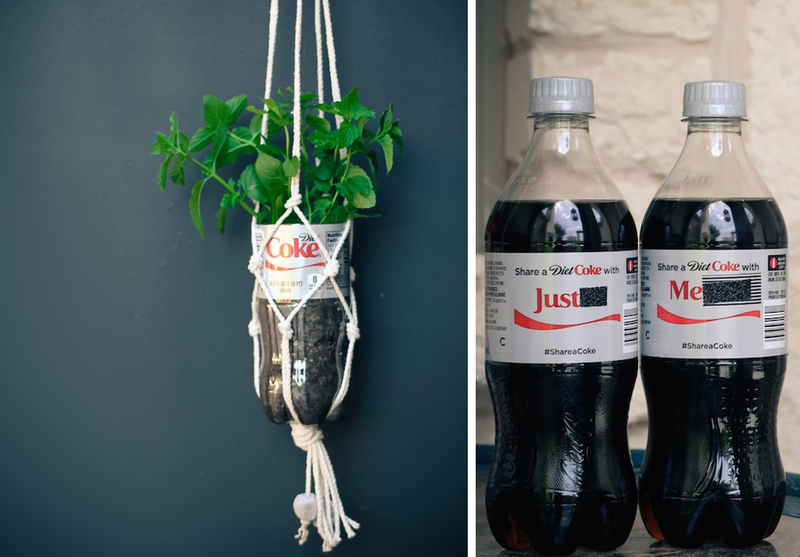 A Diet Coke bottle actually make a perfect planter for an herb garden, as the shape of the bottom of the bottle allows it to nestle nicely into your hanging rope. Follow this DIY and you will be planting your own little hanging herb garden in no time at all. 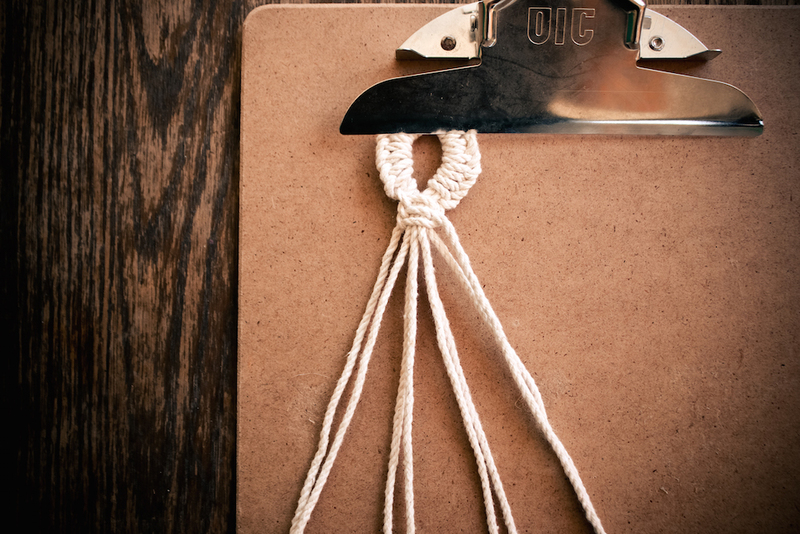 Macramé is just tying knots, and we break it down for you very simply after the jump. It’s also key to make sure people understand that all the Diet Coke belongs to you, and you plan to keep it that way. First you need to prepare your bottle. Tell your friend Megan that you love her, but are busy for a few hours. Use some washi tape to make it clear who this Diet Coke belongs to, then drink it all. Use a craft knife or sharp scissors to cut off the top of the bottle. Now your bottle is ready to be planted with whatever herbs or succulents you desire. 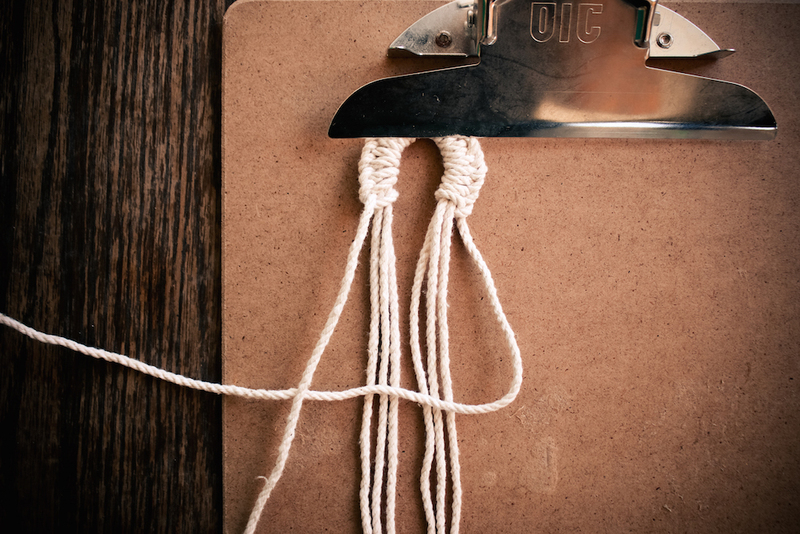 Now it’s time to macramé. Start by cutting your cord. 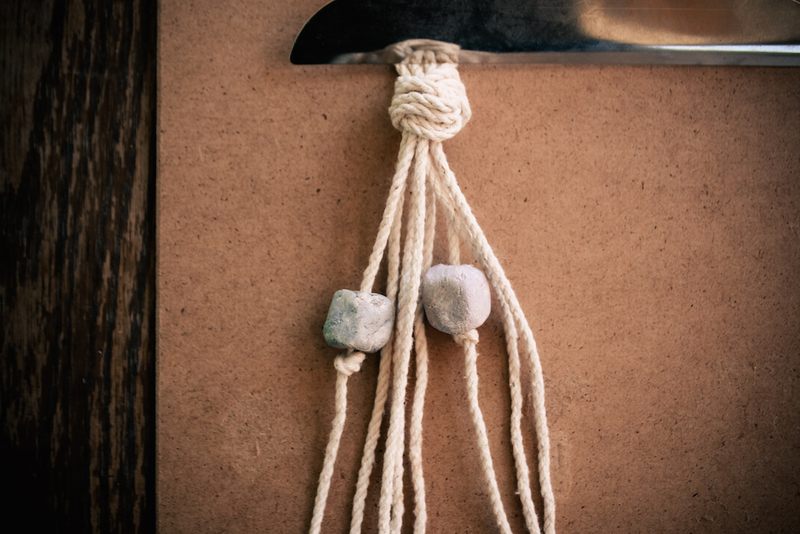 You can use anything you want, we love paracord and jute, or even yarn (though I wouldn’t want yarn to get wet at all), but we used thick cotton twine. Cut 3 lengths of cord to 8 feet long. 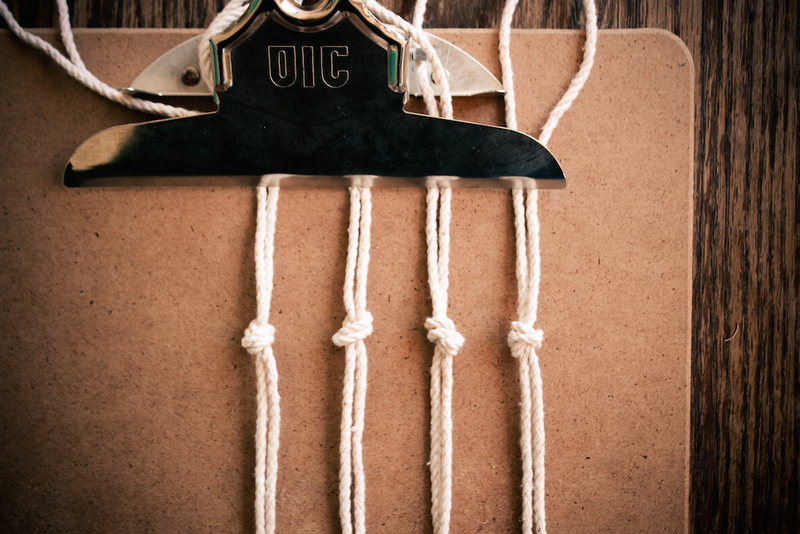 Cut one length of cord to 11 feet long. Now hold all four cords together aligned at one end. 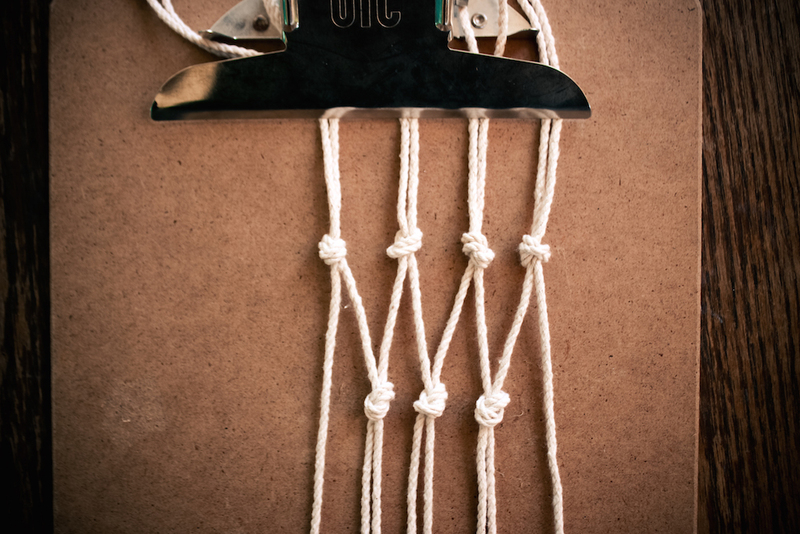 Fold them so three of them are folded in half, but let the extra length of the 11′ cord hang down below the rest. 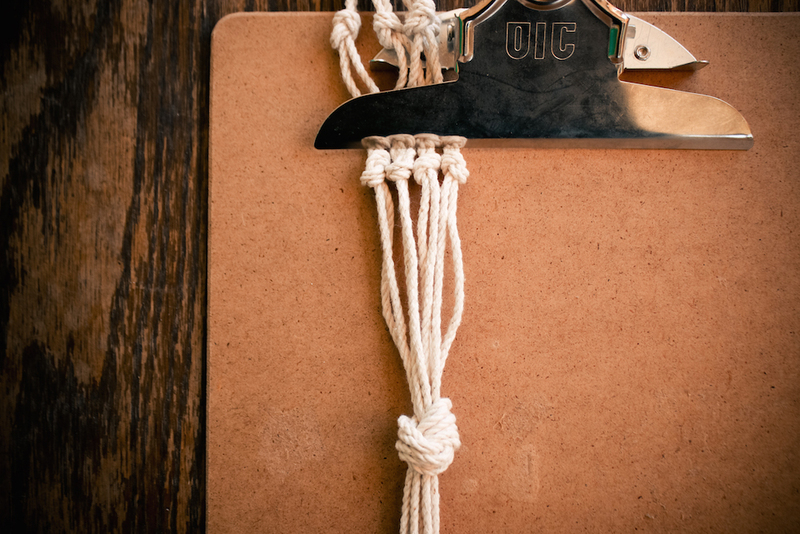 Clip the folded end into a clip board like so. 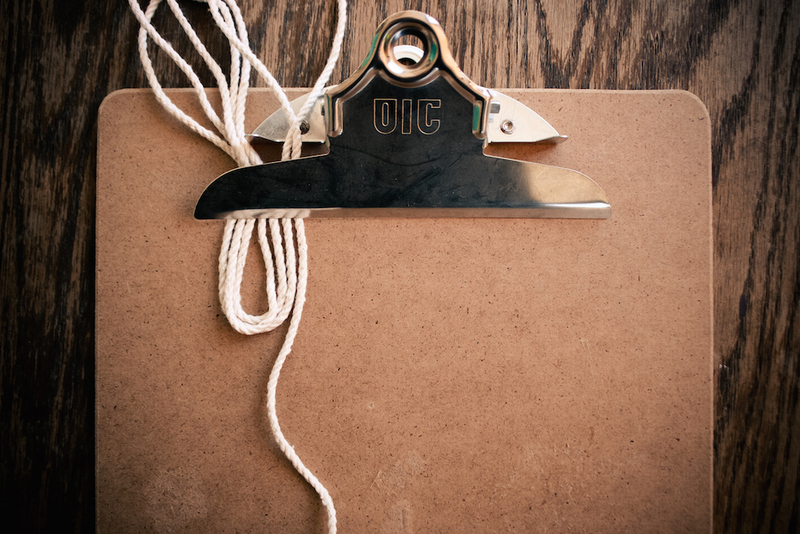 Keep the extra long cord on the right hand side, and pull the length through, so the whole piece is hanging down, not folded at all, with the extra length below the clip. then back over the cords, and under itself. 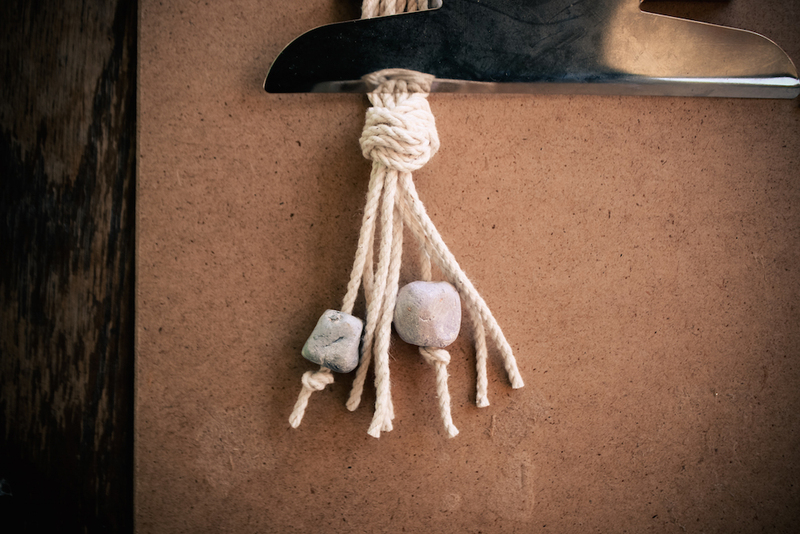 until you have tied twenty knots in this fashion. 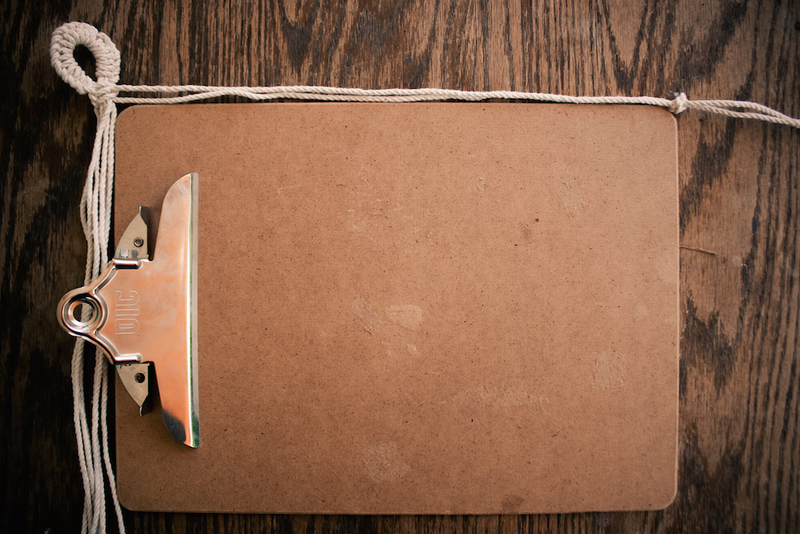 You may want to rotate your clipboard as you go. 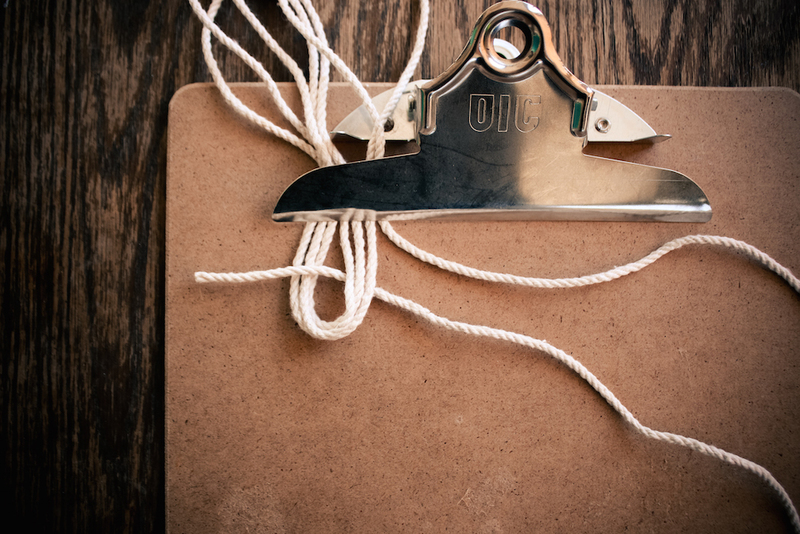 Pull the knots very tight as you go. When you have completed 20 knots, your loop will be complete. 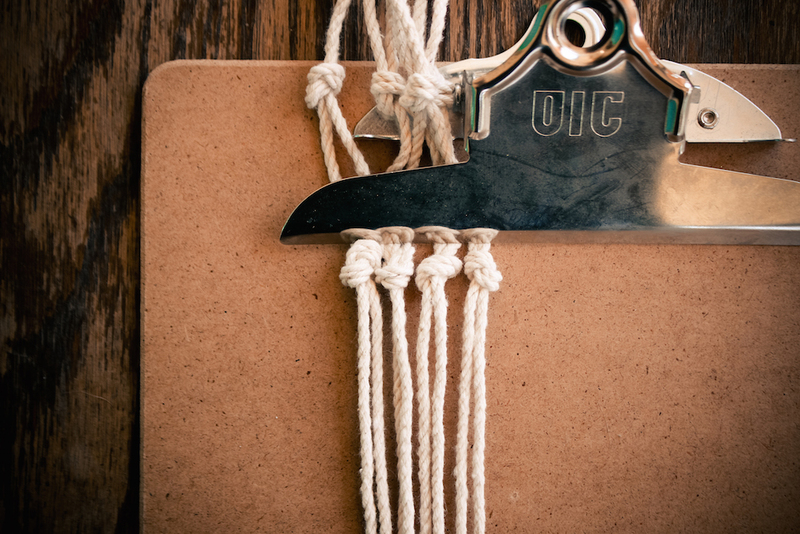 Take the right hand length of cord and extend it over the inner six pieces, and pull it under the left hand length of cord. 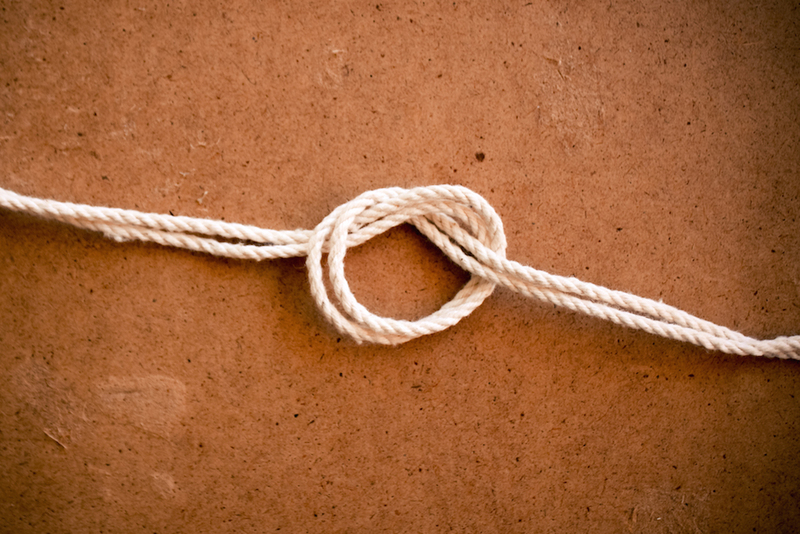 Take the left hand length of cord, loop it under all seven pieces and over the right hand cord. Repeat until you have tied 3 knots. 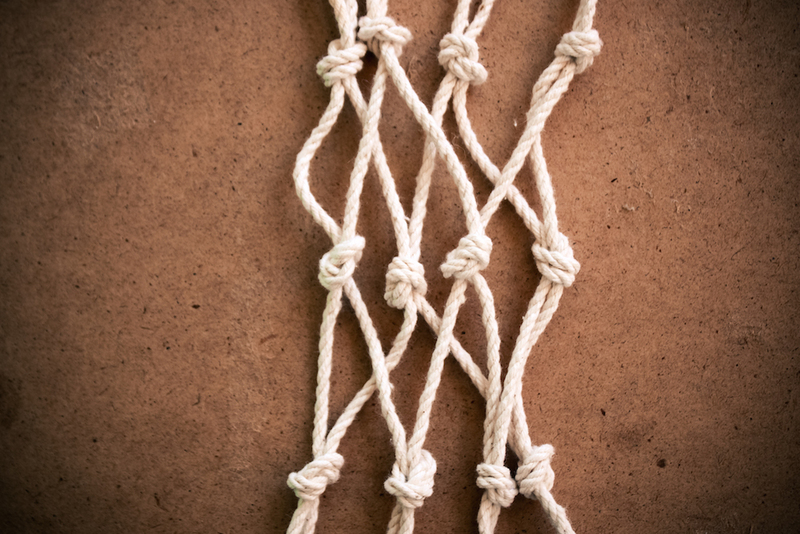 Now group your eight lengths of cord into groups of two. 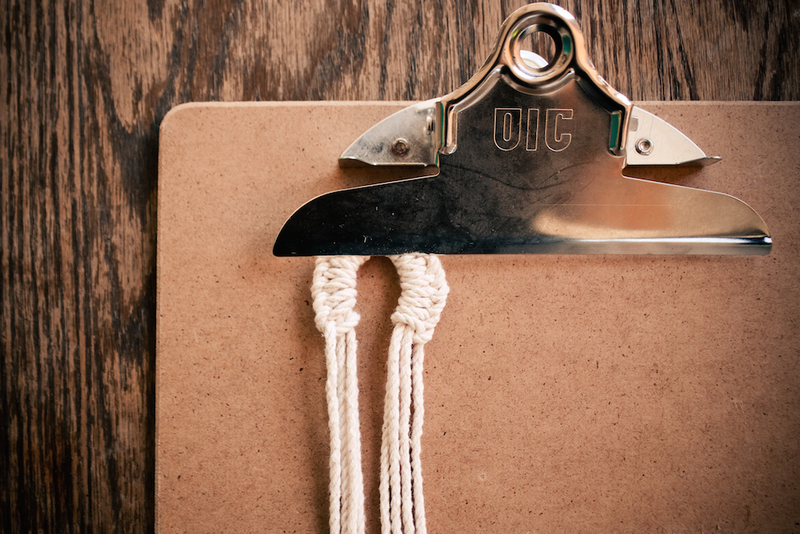 Pick the cords closest to each other to create your groups. 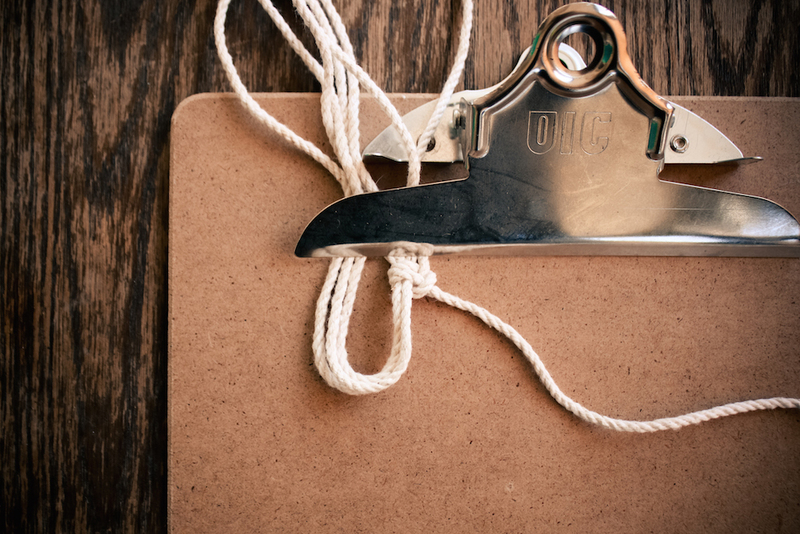 Using the side of your clipboard as a guide for length, tie a simple knot in each group of the 4 groups of 2 cords. 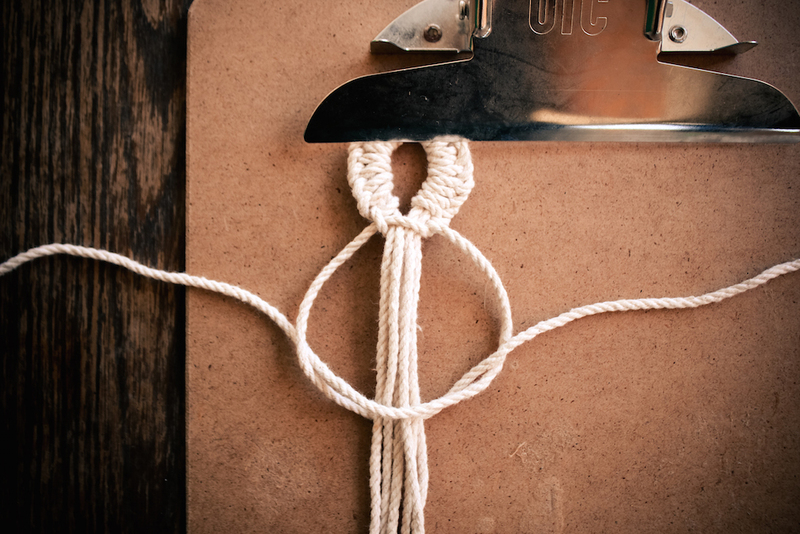 Use this simple knot technique. 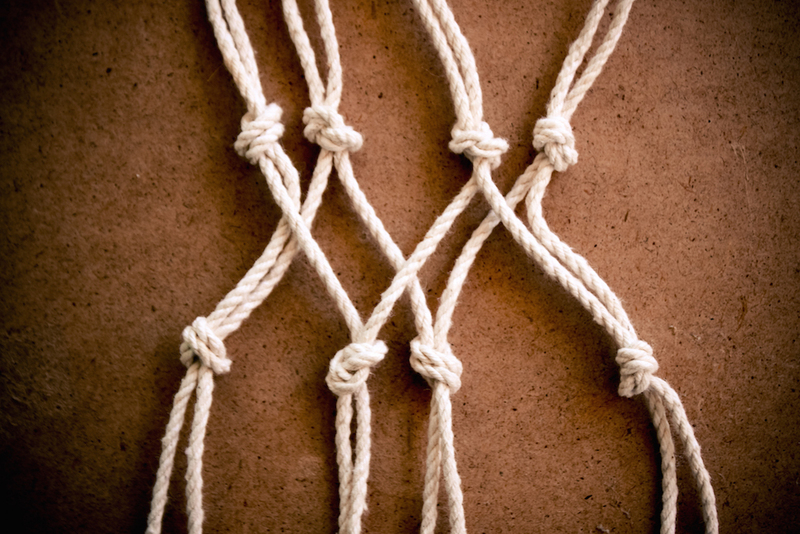 Make sure the knots are at the same length in each group. 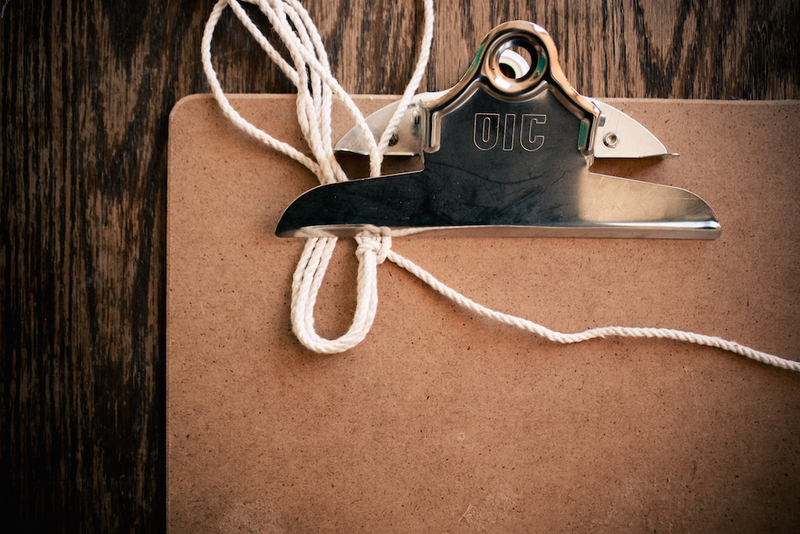 Secure the 4 groups of cords under your clip board. 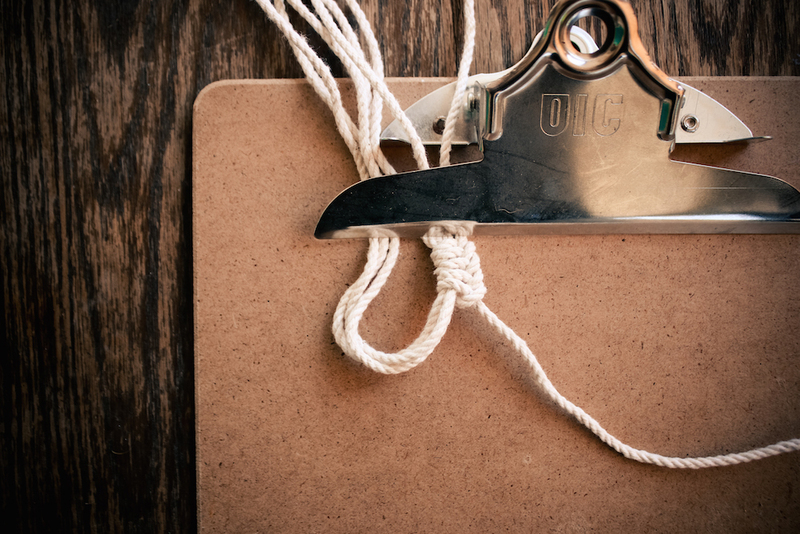 Measure down about 2 inches, and take one cord from the first group, and knot it to the closest cord in the next group using the same simple knot. 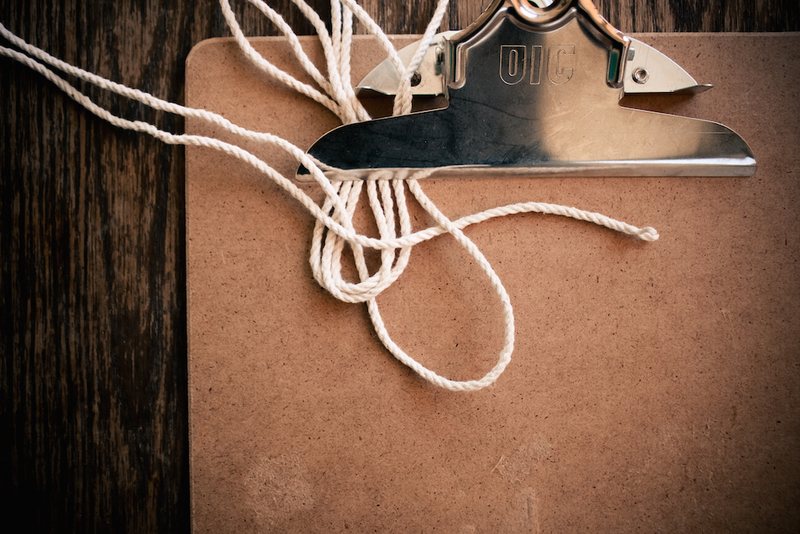 When you have attached all three, remove the project from the clipboard, and secure the remaining two outside pieces of cord with another simple knot. Now your project has taken on a tubular shape. 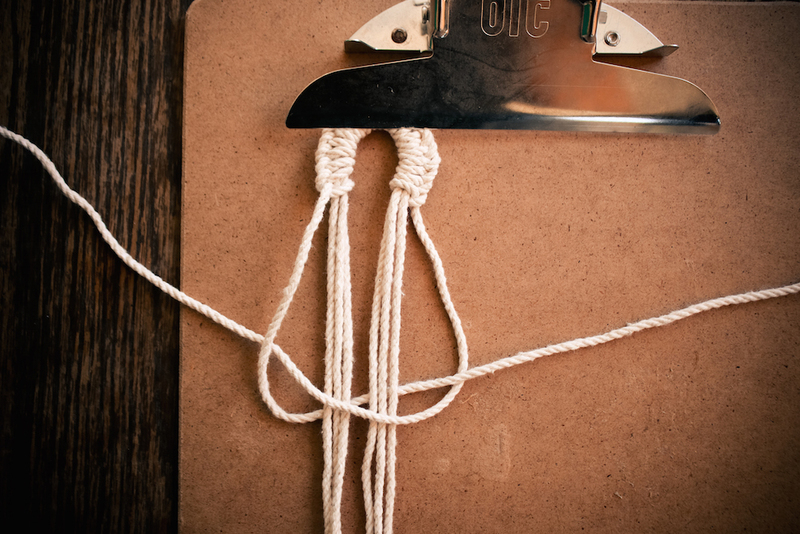 Repeat the process above by pulling one cord from each of the last knots and securing it to an adjacent cord with a simple knot about 2 inches down from the previous row. 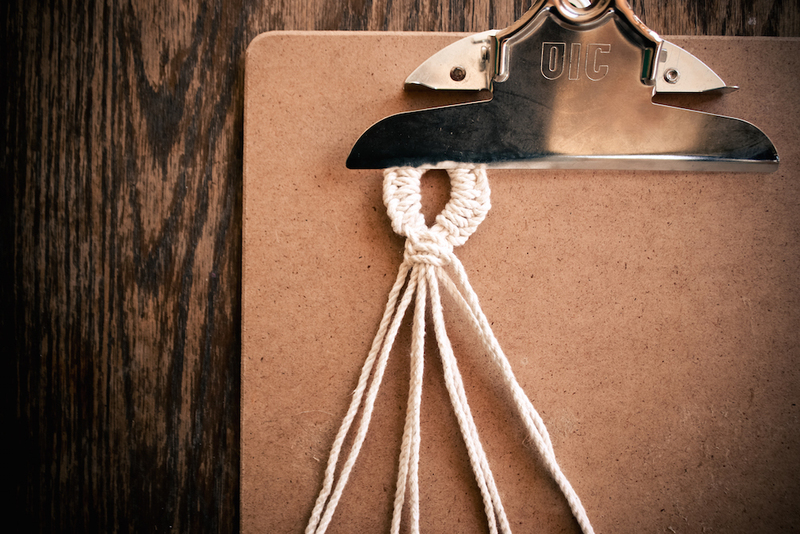 Now clip your macramé to the board right above the final row of knots. 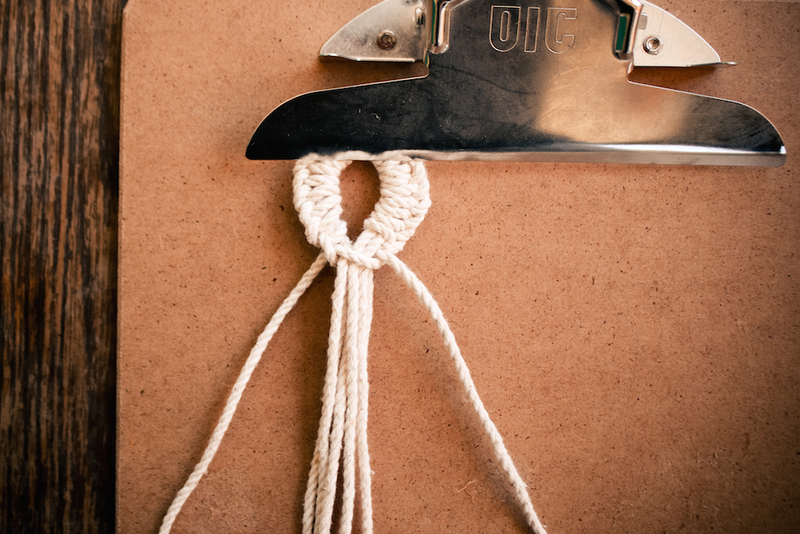 Measure about 3 inches down and tie all eight cords together in a large, tight knot. 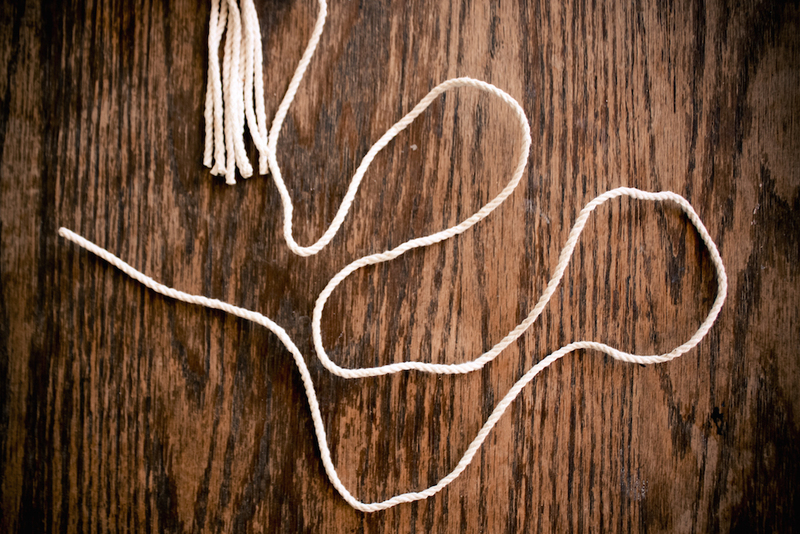 At this point, you can add beads if you desire, just by stringing them and tying knots in each individual cord. I found these handmade ceramic beads here, but wood beads are always a classic for macramé. 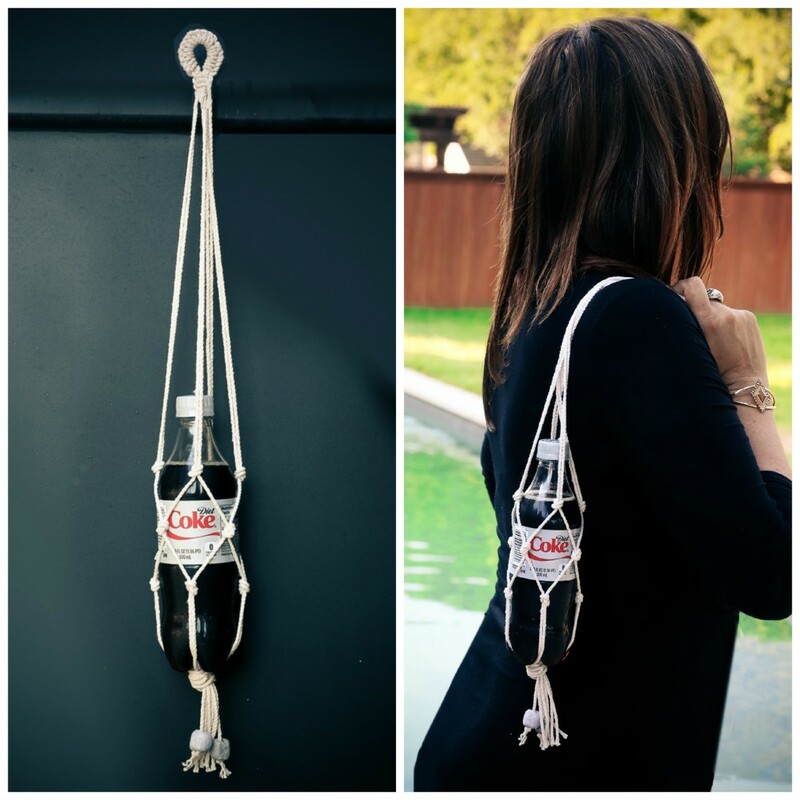 Trim your rope to create a pretty tassel that will cradle your Diet Coke in its loving embrace. or just protect your Diet Coke. 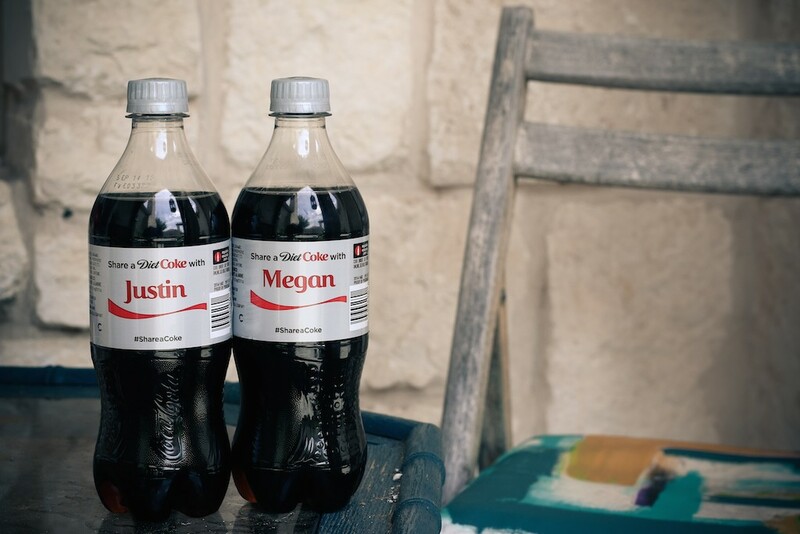 Share a Diet Coke with Justin and Megan? I mean you could. Or you could keep it for yourself. Just saying. 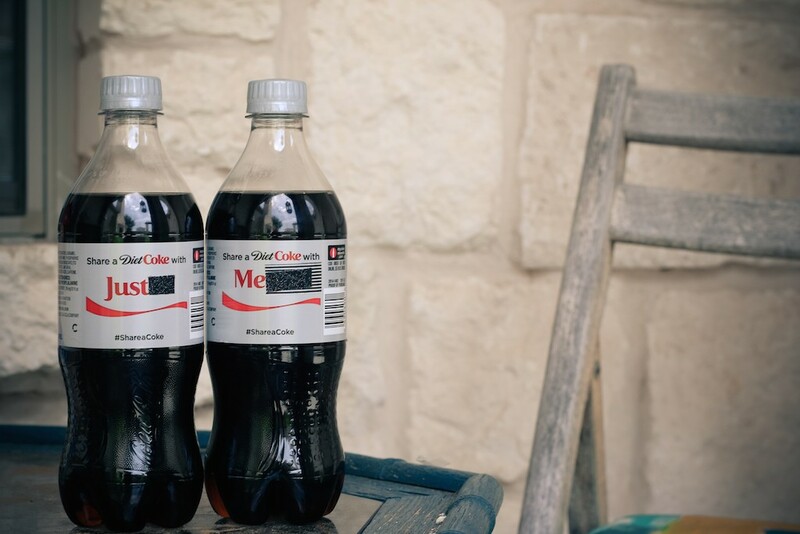 Now enter for a chance to win your very own, personalized bottle of Diet Coke! 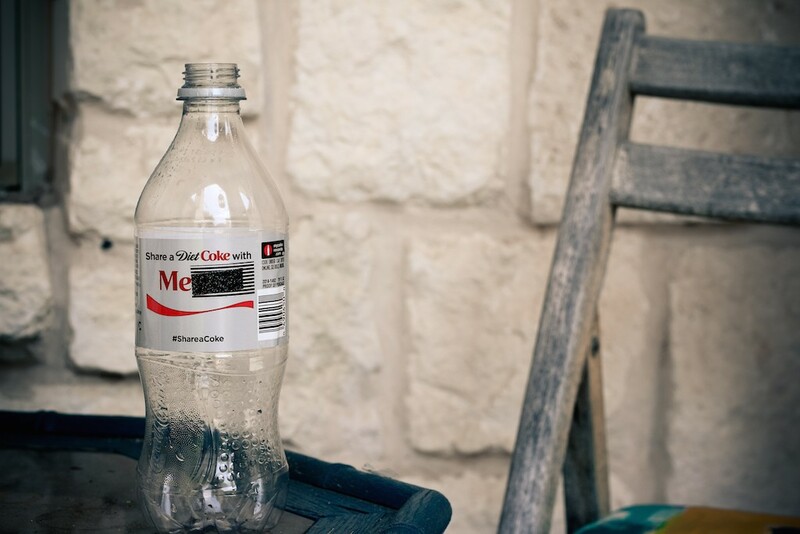 In the meantime, learn more fun tips and tricks to keep every Diet Coke you find this summer (even if it doesn’t have your name on it!) 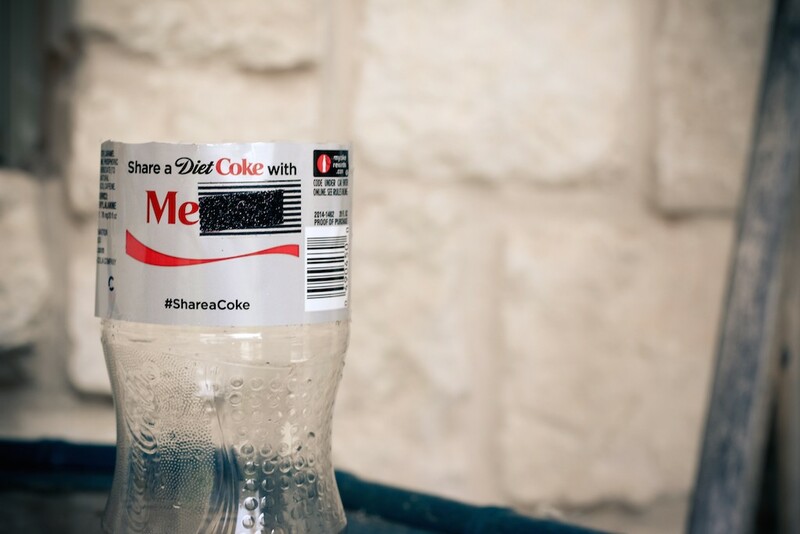 by following Diet Coke on Facebook and using hashtag, #ItsMyDietCoke on Twitter! 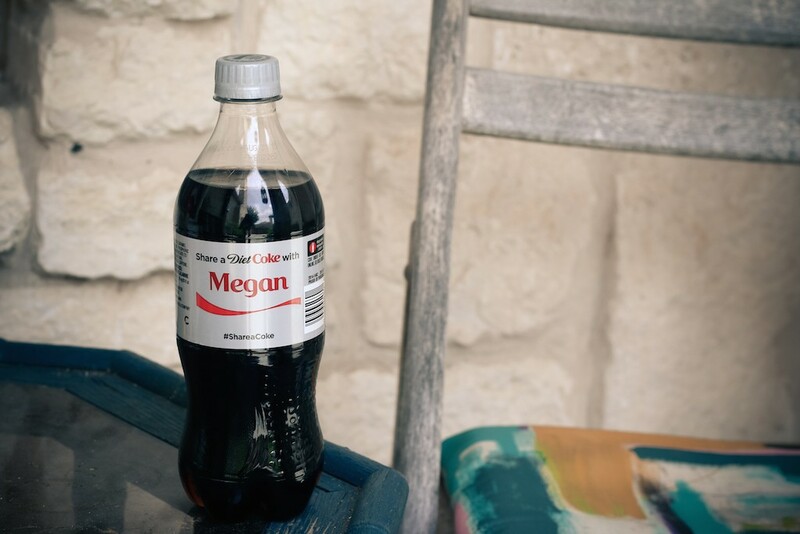 For a bonus entry, show us how you make any Diet Coke your own – even if it doesn’t have your name on it – by snapping a picture and sharing it with us @PrettyPrudent with the hashtag #ItsMyDietCoke! Good luck and happy not sharing, fellow Diet Coke fans! This post was sponsored and inspired by Diet Coke. As usual, all opinions are my own, especially the opinion that I love Diet Coke. This worked swimmingly! I have a huge tupperware bottle that just can’t fit into any bag, now it has a lovely yarn carrier I just tote around whenever! Thank you so much for sharing!